I have been living in America for 12 years now. By now you would think that I would have the use of American words mastered. But every now and then something pops up and I realize that I’m speaking Australian rather than American. I stumbled upon another word that I needed to “translate” today, while writing out the recipe for these Coconut Chocolate Squares. 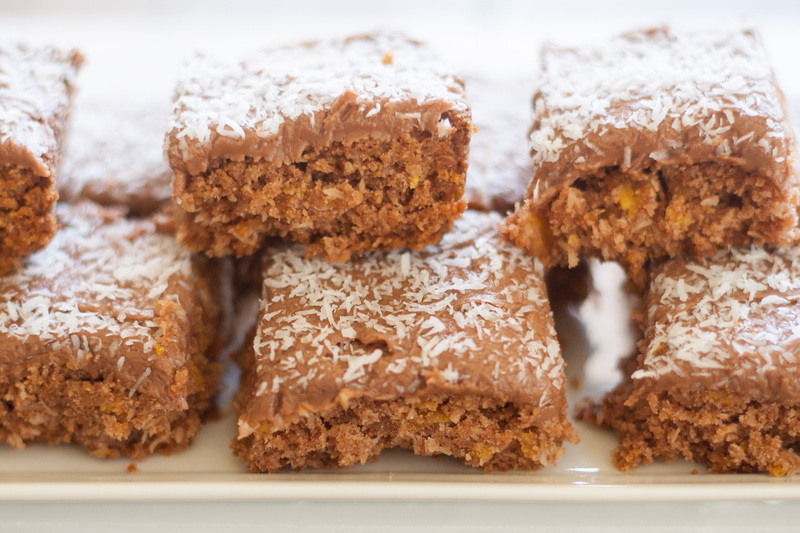 You see, in Australia, this would be a Coconut Chocolate Slice. A slice is anything that is baked in a square or rectangle pan, and then sliced into bars or squares. Once again, I had to go to my friends and ask them for help. The answer came back very solidly – the word is a Square or Bar. 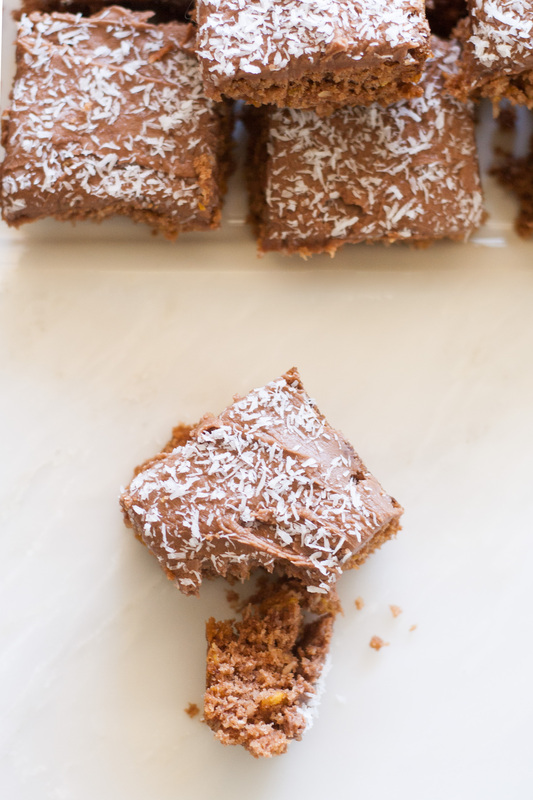 I have therefore decided to rename this recipe “Coconut Chocolate Squares” in honor of my (not so) new homeland! These squares have a nice crunch to them, thanks to the cornflakes. 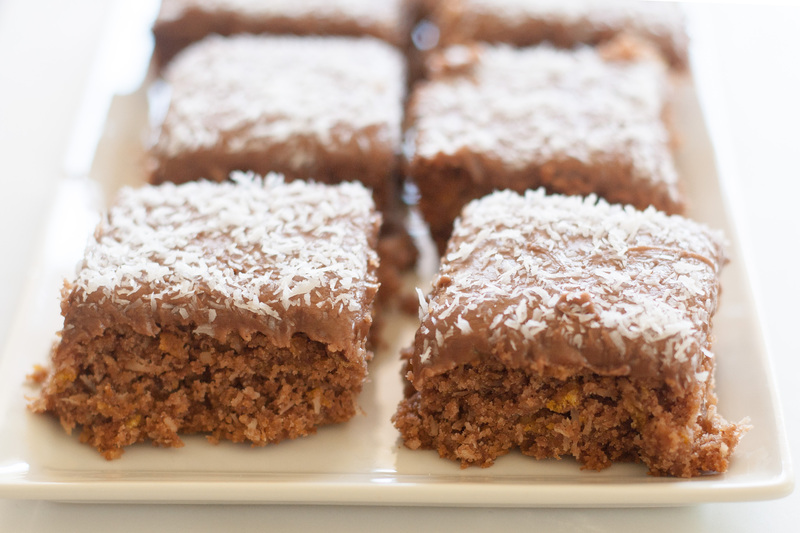 There is coconut both inside and on top – giving it that delicious chocolaty coconut taste. I use unsweetened, shredded coconut for this recipe. Sweetened coconut is another food that I never knew about until I moved to America. These squares adapt well to gluten free flour blends. I use Namaste Gluten Free Perfect Flour Blend . Just make sure you choose gluten free cornflakes such as Nature’s Path Organic Corn Flakes . The glaze is a simple frosting, with a lot less butter. Growing up, this is how we used to ice all our cakes, as well as slices. When I first moved to America, I was amazed by the amount of frosting that people put on cakes and cupcakes. I had never seen a cupcake with over an inch frosting until I walked into a cupcake shop one day in San Francisco! Talk about dying and going to heaven! Butter gives frosting the thick, fluffy look. By reducing the butter, the frosting is more sugary than creamy. I have named this a “glaze” as it’s not what you would expect from a frosting. Preheat the oven to 350°F. Grease a square 8” cake pan. In a large bowl, combine the flour, baking powder, salt, cocoa, sugar, cornflakes and coconut to the bowl. In a small saucepan, melt the butter and golden syrup over a low heat. Add the butter to the flour blend. Using a wooden spoon, mix in the butter until all the ingredients are well combined. Using your hands, press the mixture into the greased pan. Remove the pan from the oven and leave it on a cooling rack until the pan is cool enough to touch, but still warm. Tip the large chocolate coconut square onto a cutting board. 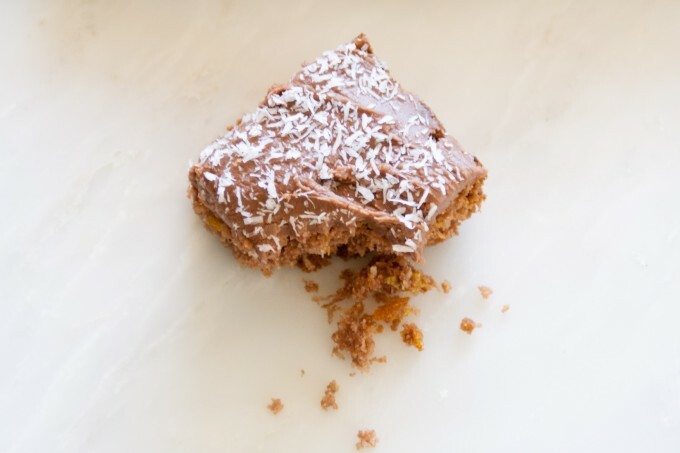 Cover the large square with the chocolate glaze (see recipe below) and sprinkle with the coconut. Cut the square into 16 squares, or sized as desired. Place the cocoa in a small bowl, then add the boiling water and butter. Mix the cocoa until the butter has melted. Place the confectioner's sugar in a medium sized bowl. Add the cocoa mix and combine until the glaze is smooth. If desired, you can add more water, one teaspoon at a time, for a runnier glaze. This recipe adapts well to a gluten free recipe. Use any gluten free flour blend and make sure you use gluten free cornflakes.